Today's recipe is a very simple recipe. 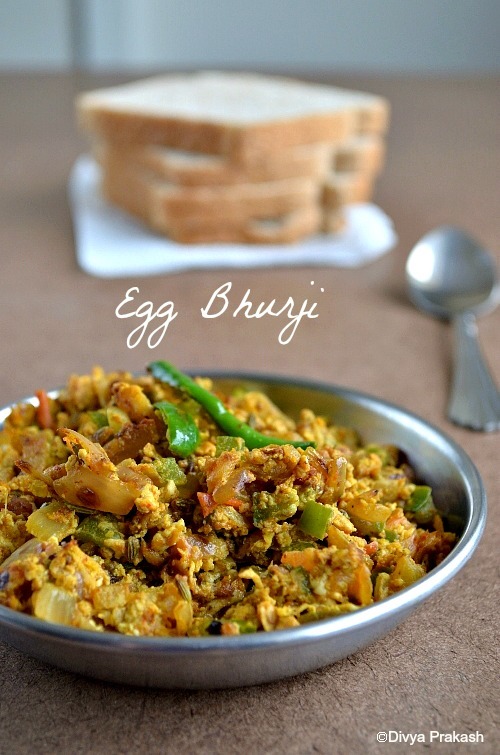 It is Egg bhurji. You can also call it Muttai masala Poriyal in Tamil. It is basically the Indian style scrambled eggs. It is very easy to prepare and also can be made in a jiffy. It can be served with rotis/ chappathis or even with bread. I like to have it with Rice and Rasam. Beat eggs and set them aside. Heat oil in a skillet. Add onion, green chillies and capsicum and fry till the onions turn translucent. Now add tomatoes and ginger, cook for few minutes. Then add turmeric powder, Chilli Powder and cumin Powder and cook till the raw smell disappears. Then add salt mix well and add the beaten eggs and keep stirring till the eggs are cooked. Adjust the spice level as per your personal preference. If you want you can add garam masala too. I have used Roma tomatoes. I usually do not prefer adding juicy tomatoes. If you want, you can skip adding tomatoes too. simple yet delicious side rt? ur clicks are too tempting da...lovely presentation too! 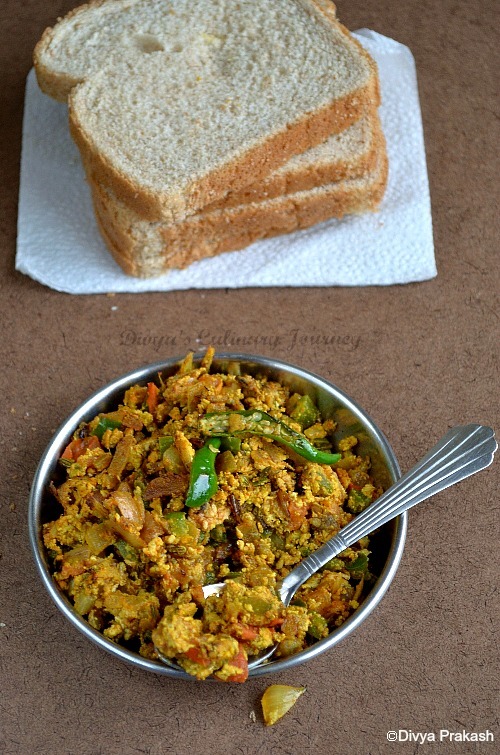 My husband always loves this Burji, it looks delicious. I will make it for side dish today. never tried adding capsicum,looks so yum.Perfect for sandwiches. I can have it with anything, sometimes i do add many veggies, love here the addition of capsicum. 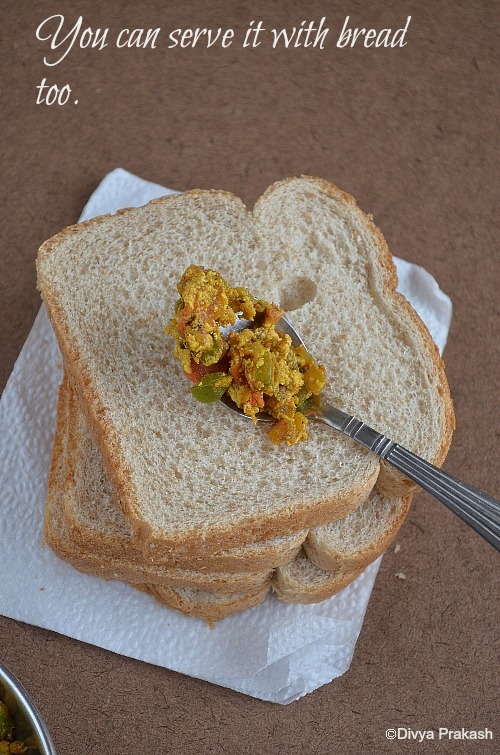 Looks too good dear, bread and egg bhurji, wonderful combo..
i dont add capsicum here.. looks delicious dear.. 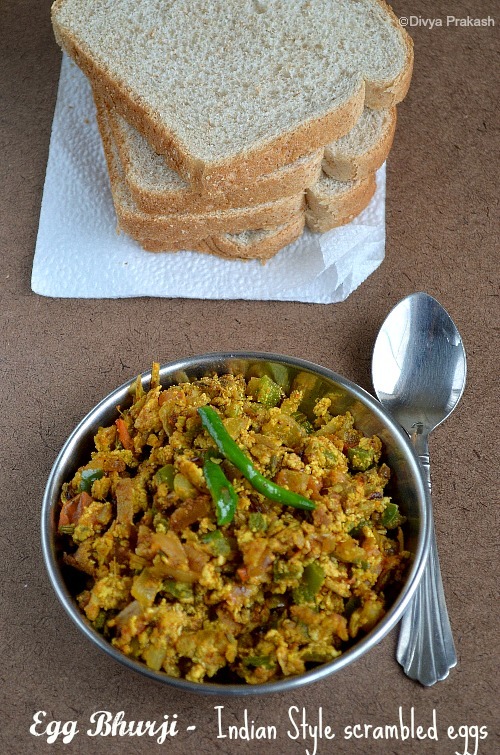 Absolutely delicious egg bhurji I make it almost the same way with no bell pepper..